2000 (2nd May.) Fifty-billion dollars. The warship HMNZS "Wellington". Printed by KDPN on white security paper. 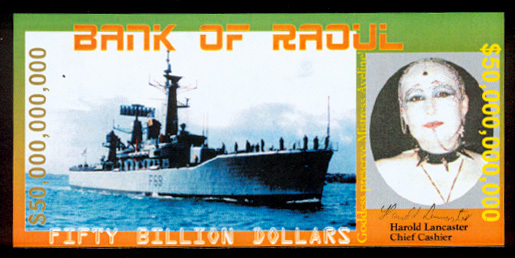 The ship shown on this banknote was also illustrated on a Raoul stamp. Click here to view the stamp. The Raoul dollar is tied to the Australian. Click here to convert your currency into Australian. Raoul citizen, or just a fan? Get free Raoul e-mail here!